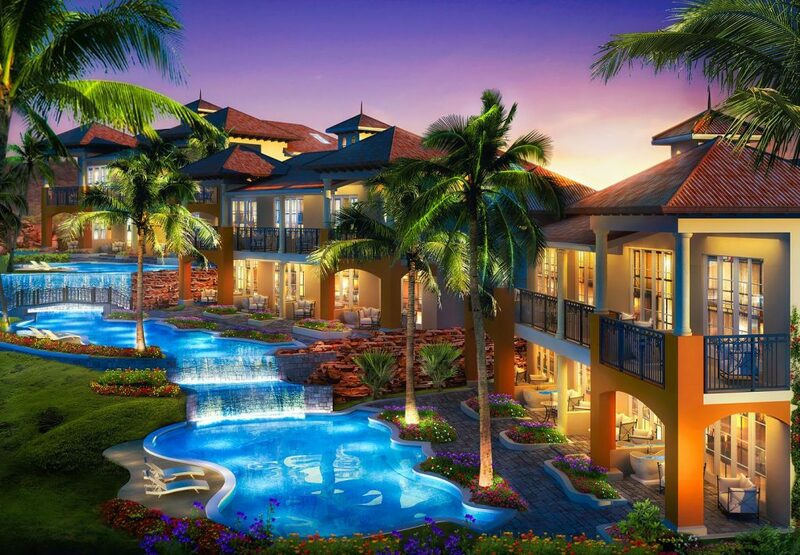 Defying every convention of traditional design, the new Sandals LaSource Grenada takes innovation beyond the realm of imagination to create an extraordinary resort unlike anything you have ever experienced. Pools in the sky and living rooms in swimming pools. 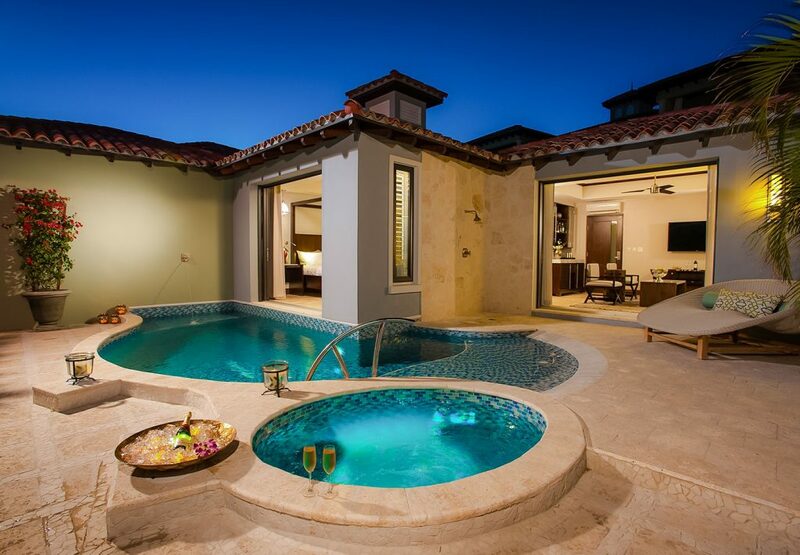 Private plunge pools, cascading waterfalls and meandering river pools. Here, in the heart of Grenada’s exclusive Pink Gin Beach, on an exotic island paradise where the intoxicating scents of spice and tropical blooms make a heady elixir for romance, we’ve taken the best of everything to create a whole new Sandals experience… one that takes you beyond the unexpected. 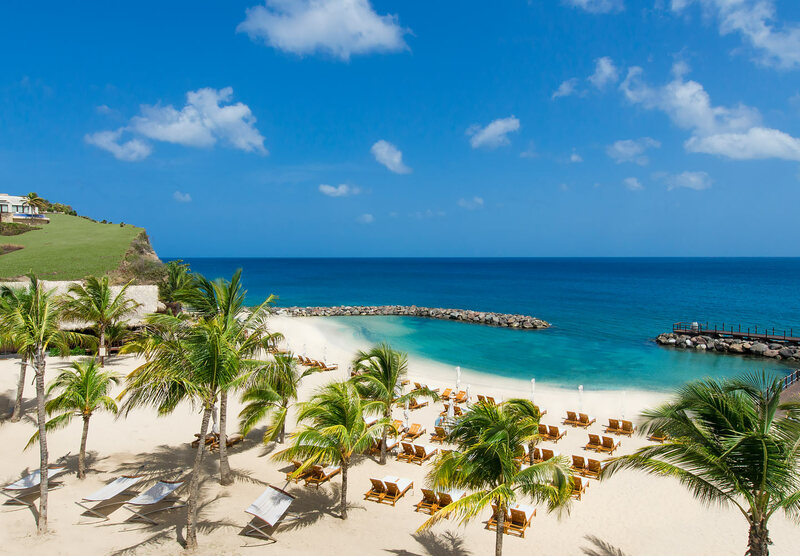 Known as, The Island of Spice, Grenada is a truly exotic paradise, one that just happens to be the perfect landscape for a Sandals Resort. This “Island of Spice” is known for it’s remarkable natural beauty, pristine beaches, impossibly blue seas, and a veritable treasure trove of spices – cinnamon, ginger, cloves, and particularly nutmeg, it’s most sought-after spice. 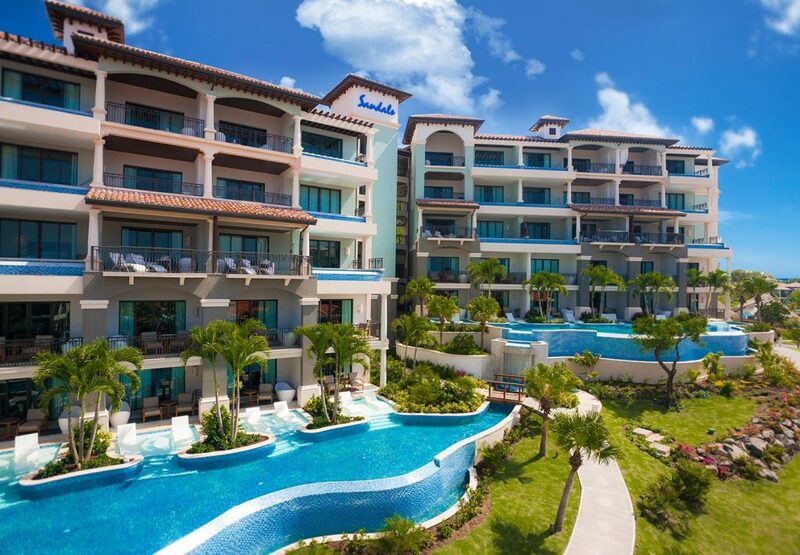 In our view, one of the highest standard property of all the Sandals resorts. Set on a truly beautiful beach, Sandals have captured a real sense of place here, envelop yourself in authentic Caribbean charm and the iconic Sandals luxury. Situated on the picturesque south coast of Grenada, just a few minutes drive from the airport. 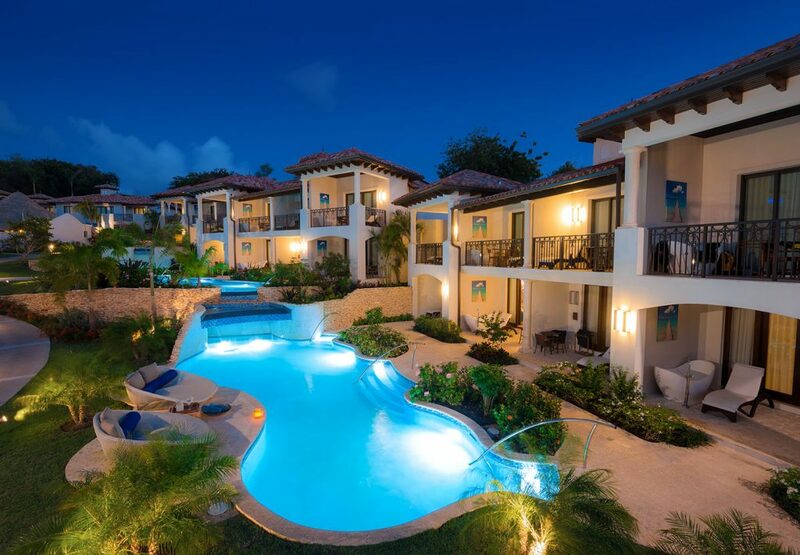 The stylish and spacious suites at Sandals La Source Grenada are arranged in four spectacular villages; Pink Gin, South Seas, Lovers Hideaway and Italian, featuring gorgeous views of the Caribbean Sea from its privileged location in the heart of Grenada’s exclusive Pink Gin Beach. Romance soars to new heights in our exclusive Skypool Suites, where an infinity-edge pool on an oversized balcony blends seamlessly with the distant horizon. Italian Oceanview Penthouse One Bedroom SkyPool Butler Suite with Balcony Tranquility Soaking Tub – Perched atop the Italian Village, these magnificent oversized Love Nest Suites are the pinnacle of luxury. The exceedingly romantic bedroom boasts a king-size bed with direct access to a private cantilevered, solar heated plunge pool with infinity edge where couples can admire the stunning ocean while floating in the sky. Equally impressive is the suite’s living room complete with an indoor dining table, writing desk with plush sofa, a smart television, a butler pantry, and fully-stocked wet bar featuring premium spirits. The stylish living area leads to an expansive balcony and features an opulent Tranquillity Soaking Tub for two -ideal to relax while soaking in the Caribbeans surrounding tropical beauty and splendour. Exquisite details including Carrera marble vanities with back-lit mirrors, a Kohler claw footed tub, separate frosted-glass shower and flooring made of Turkish ivory patika travertine natural stone with accents of pebbles adorn the luxurious bathroom. Butler Elite and 24-hour room service included. South Seas Honeymoon One Bedroom Butler Suite with Private Pool Sanctuary – Boasting the utmost in privacy, these Tahitian-style Love Nest Suites are perfect romantic havens featuring the exceptional service of a personal butler. The opulent bedroom features a king-size bed and smart television, as well as, a separate living area complete with an elegant sofa, dining area, fully-stocked wet bar, a second smart television, and writing desk. Both the luxurious bedroom and elegant living room reveal direct access to a private outdoor sundeck complete with plunge pool and whirlpool where you can enjoy fun-filled sunny days and romantic nights. Exquisite details including a spacious spa-style bathroom with a freestanding soaking tub, Carrera marble vanities with back-lit mirrors and flooring made of Turkish ivory patika travertine natural stone and porcelain planks made in Italy, add to the allure of this glamorous retreat. Butler Elite and 24-hour room service included. Italian Oceanview One Bedroom SkyPool Butler Suite Balcony Tranquillity Soaking Tub – Located on the third, fourth and fifth floors of the Italian Village, these magnificent oversized Love Nest Suites are the pinnacle of luxury. The exceedingly romantic bedroom boasts a king-size bed with direct access to a private cantilevered, solar heated plunge pool with infinity edge where couples can admire the stunning ocean while floating in the sky. Equally impressive is the suite’s living room complete with an indoor dining table, writing desk with plush sofa, a smart television, a butler pantry, and fully-stocked wet bar featuring premium spirits. The stylish living area leads to an expansive balcony and features an opulent Tranquillity Soaking Tub for two -ideal to relax while soaking in the Caribbean’s surrounding tropical beauty and splendour. Some have an oversized day bed. Exquisite details including Carrera marble vanities with back-lit mirrors, a Kohler claw footed tub, separate frosted-glass shower and flooring made of Turkish ivory patika travertine natural stone with accents of pebbles adorn the luxurious bathroom. Butler Elite and 24-hour room service included. South Seas Grande Rondoval Butler Suite with Private Pool Sanctuary – Sandals’ unique Rondoval Suites offer eternally romantic escapes. These exceptional Love Nest Suites feature a soaring 20-foot conical ceiling, a custom mahogany king-size bed, and a lavish private pool sanctuary-with direct access from the bedroom. The living area impresses with elegant details including a smart television, indoor dining, fully-stocked wet bar and floors made of ivory patika and porcelain planks with pebble and coral stone accents. The bathroom boasts a large soaking tub carved out of solid stone, plus, his and hers Carrera marble vanities with back-lit mirrors. Among the highlights of this circular suite is a spacious patio with a zero entry plunge pool, a whirlpool complete with a waterfall, lounge chaises and dining table. Surrounded by lush foliage, these private villas offer an exotic paradise that brings love full circle. Butler Elite and 24-hour room service included. 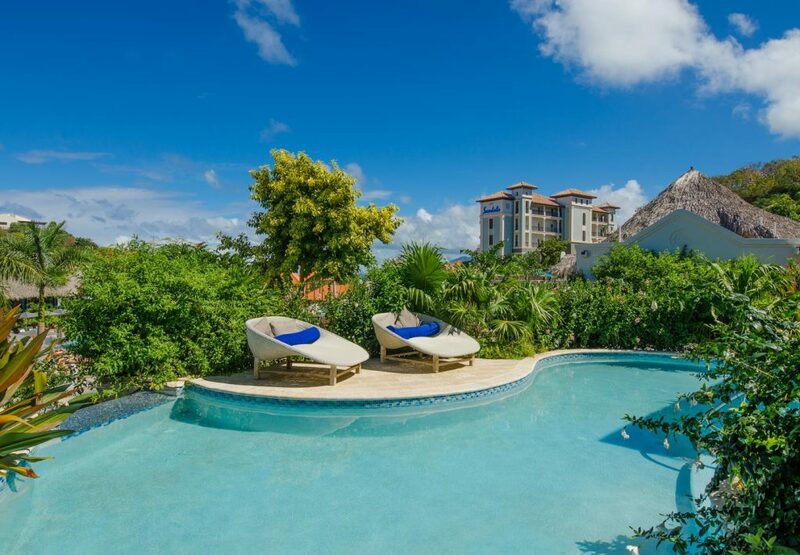 South Seas One Bedroom Butler Suite with Infinity Edge Pool – South Seas One Bedroom Butler Suites offer enviable privacy and extravagant luxury. Nestled on the hillside, these lovely Love Nest Suites are seductive sanctuaries. The romantic bedroom boasts a luxurious king-size bed, smart television and offers direct access to a private plunge pool featuring an infinity edge, a whirlpool, and outdoor shower to cool off during the hot sunny day. The elegant living room reveals a trellised veranda with double chaise lounges, a fully-stocked wet bar and an exterior dining area ideal for enjoying the Caribbean breeze. The luxurious bathroom boasts a large soaking tub carved out of solid stone, a frosted-glass shower, a water closet and two Carrera marble vanities with back-lit mirrors. 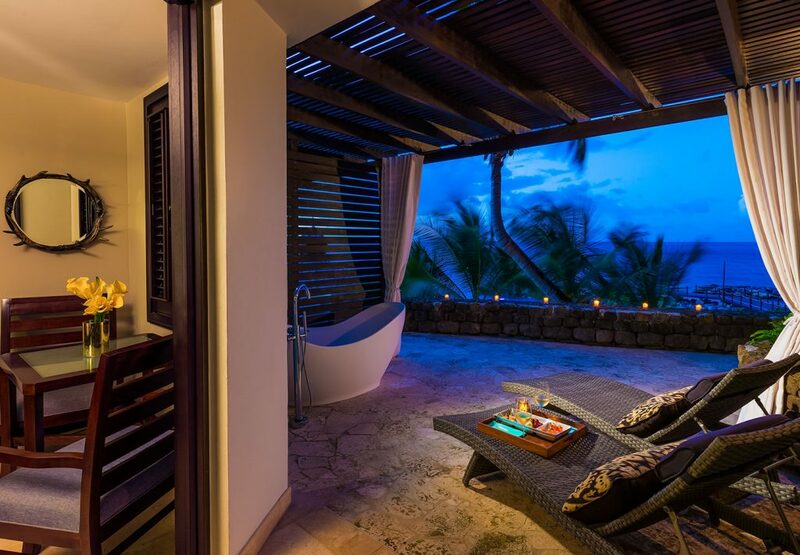 Additionally, the bathroom conveniently leads to a private terrace carved out of the mountains. Butler Elite and 24-hour room service included. Italian Swim Up Bi-level One Bedroom Butler Suite Patio Tranquility Soaking Tub – Nestled within the opulent Italian Village, these spectacular Love Nest Suites offer a stylish haven with magnificent views and sophisticated features. The large bedroom boasts a king-size bed with chic furnishings, walk-in closets, a writing desk, a smart television and a step-down parlour area featuring an oversized sectional sofa, and a fully-stocked wet bar to enjoy a nightcap. The romantic alcove offers an indulging outdoor Tranquillity Soaking Tub for two with privacy curtains to relax in tropical bliss and a private entrance to the resort’s zero-entry river pool, giving couples the luxury to walk directly from their suite into the pool’s refreshing water. Meanwhile, the suite’s spa-style bathroom includes a walk-in shower, freestanding soaking tub, vanity and dressing unit. Butler Elite and 24-hour room service included. Italian Bi-Level One Bedroom Butler Suite Balcony Tranquillity Soaking Tub – Ideally situated in the Italian Village, these beautiful Love Nest Suites offer an exotic escape with every luxury imaginable. The spacious bedroom features a king-size bed with chic furnishings, walk-in closets, a writing desk, a smart television and a step-down parlour area. Boasting an oversized sectional sofa and a fully-stocked wet bar, the elegant parlour opens up to an expansive balcony with an indulging Tranquillity Soaking Tub for two and dining table to enjoy time al fresco. A stunning spa-style bathroom completes the suite with a luxurious freestanding soaking tub, walk-in shower, and a vanity dressing unit. Undoubtedly, this romantic enclave boasts an intimate feel in an utmost luxurious setting. Butler Elite and 24-hour room service included. Pink Gin Beachfront Honeymoon Club Level Suite – A large suite consisting of a living area with a sofa, chairs, cocktail table and bar. The bedroom boasts a king size bed, ivory patika marble floors and smart TV. The bathroom has a water closet enclosed in frosted glass, extra-large basin with back-lit mirror, Carrera marble vanity and walk in shower with white subway tile and glass accents. There is an overhead shower and wall-mounted dual controls. The bathroom is further enhanced with pebble accented walls and Italian porcelain plank floor. There is also a window looking into the bedroom. Club Sandals service included. All rooms feature either a patio or a balcony. Pink Gin Beachfront Walkout Club Level Room Patio Tranquillity Soaking Tub – Located directly on the beach, you can walk out of the room and onto the beach. The bedroom features a custom mahogany king-size bed, smart TV and ivory patika marble floors and dining table. The bathroom boasts a walk in shower with subway tile and glass accents, an overhead showerhead and wall-mounted dual control. There is a window looking into the bedroom. The walls are pebble accented and the floor is Italian porcelain plank with an extra-large basin, back-lit mirror, and Carrera marble vanity. Club Sandals service included. All rooms have a patio with two lounge chairs and a private Tranquillity Soaking Tub for two. Pink Gin Oceanfront Honeymoon Penthouse Club Level Room – Located in the Pink Gin Block, these rooms boast a king size mahogany bed, vaulted ceilings, marble floors and smart TV with an in-room dining table. The bathroom features porcelain plank floors, walk in shower in white subway tiles with glass accents, an overhead shower and wall-mounted dual control. There is also a window opening up into the bedroom. The water closet is enclosed in frosted glass, an extra-large basin with back-lit mirror and Carrera marble vanity. Club Sandals service included. Pink Gin Oceanview Club Level Suite – A large suite consisting of a living area with a sofa, chairs, cocktail table and bar. The bedroom features a king size, custom mahogany bed, Turkish ivory patika marble floors and smart TV. The bathroom includes a private water closet enclosed in frosted glass, extra-large basin with lit mirror, Carrera marble vanity with either a walk-in shower or tub with white subway tile and glass accents. The walls are pebble accented along with Italian porcelain plank floors. Club Sandals service included. Pink Gin Beachfront Room – The bedroom boasts a custom mahogany king size bed, Turkish ivory patika marble floors, smart TV and in room dining table. The bathroom includes a private water closet enclosed in frosted glass, extra-large basin with back-lit mirror, and a Carrera marble vanity. There is a walk-in shower with white subway tiles with glass accents, an overhead showerhead and wall mounted dual control. There is a window looking into the bedroom. The walls of the bathroom are pebble accented and the floors are porcelain plank. Some rooms feature a vaulted ceiling. Pink Gin Oceanview Room – Room includes a mahogany king size bed, Turkish ivory patika marble floors, smart TV and table for in-room dining. The bathroom features a water closet enclosed in frosted glass, extra-large basin with lit mirror, Carrera marble vanity and walk-in shower with white subway tile with glass accents. There is a window looking into the bedroom and the walls are pebble accented with porcelain plank floors. 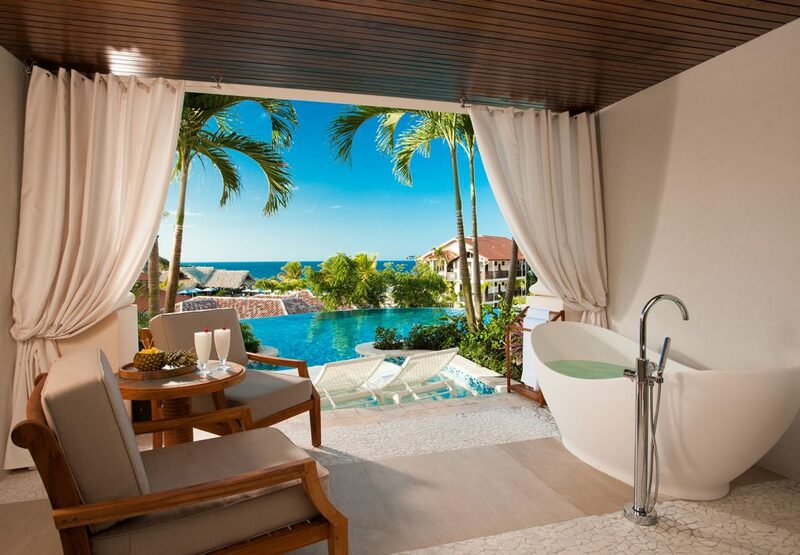 All rooms have a balcony. South Seas Waterfall River Pool Walkout Junior Suite with Patio Tranquillity Soaking Tub – You enter this large room through your patio. The bedroom includes a king size bed, smart TV and convenience outlets in 110 and 240 volts. The bathroom features a tub, walk-in shower, freestanding vanity with back-lit mirror, water closet enclosed in frosted glass and a walk in closet. The patio features a free standing Tranquillity Soaking Tub for two and a chaise lounge. The room walks out to the unique waterfall river pool. South Seas Waterfall River Pool Junior Suite with Balcony Tranquillity Soaking Tub – Enter this large bedroom from a covered vestibule. The bedroom features a king size bed, smart TV and convenience outlets in 110 and 240 volts. The bathroom boasts a large walk-in shower, vanity, and water closet enclosed with frosted glass. Walk out onto your balcony, which features outdoor dining, a free standing Tranquillity Soaking Tub for two and a chaise lounge. This junior suite overlooks the waterfall river pool. South Seas Hideaway Walkout Junior Suite with Patio Tranquillity Soaking Tub – You enter this large room through your patio. The bedroom includes a king size bed, smart TV and convenience outlets in 110 and 240 volts. The bathroom features a walk in shower, freestanding vanity with back-lit mirror, water closet enclosed in frosted glass and a walk in closet. The patio features a free standing Tranquillity Soaking Tub for two and a chaise lounge. The room walks out to a radial pool. Pink Gin Hideaway Room with Patio Tranquillity Soaking Tub – Room includes a mahogany king size bed, Turkish ivory patika marble floors, smart TV and table for in-room dining. The bathroom features a water closet enclosed in frosted glass, extra-large basin with lit mirror, Carrera marble vanity and walk-in shower with white subway tile with glass accents. There is a window looking into the bedroom and the walls are pebble accented with Italian porcelain plank floors. All rooms have a patio with two lounge chairs and a Tranquillity Soaking Tub for two. South Seas Hideaway Junior Suite with Balcony Tranquillity Soaking Tub – Enter this large bedroom from a covered vestibule. The bedroom features a king size bed, smart TV, and convenience outlets in 110 and 240 volts. The bathroom boasts a large walk in shower, vanity and water closet enclosed with frosted glass. Walk out onto your balcony, which has a free standing Tranquillity Soaking Tub for two and a chaise lounge. Lover’s Lagoon Hideaway Walkout Junior Suite with Patio Tranquillity Soaking Tub – Located in the Lover’s Hideaway Village with romantic views of the resort’s freshwater lagoon, these secluded suites feature a large patio boasting an outdoor Tranquillity Soaking Tub for two complete with privacy curtains and modern rattan furniture. The spacious bedroom showcases a four-poster, king-size mahogany bed and HD smart TV while the en-suite bathroom features an oversized walk-in shower, long vessel sink, and water closet enclosed in frosted glass. Lover’s Lagoon Hideaway Junior Suite with Balcony Tranquillity Soaking Tub – Located in the Lover’s Hideaway Village with romantic views of the resort’s freshwater lagoon, these secluded suites feature a large balcony with an outdoor Tranquillity Soaking Tub for two, complete with privacy curtains and modern rattan furniture. The spacious bedroom showcases a four-poster, king-size mahogany bed, HD smart TV and an en-suite bathroom with an oversized walk-in shower, long vessel sink, and water closet enclosed in frosted glass. Pink Gin Grande Luxe – Room includes a custom mahogany king size bed, Turkish ivory patika marble floors, smart TV and table for in-room dining. The bathroom features a water closet enclosed in frosted glass, extra-large basin with lit mirror, Carrera marble vanity and walk-in shower with an overhead rain shower with dual controls. The bathroom also features white subway tile with glass accents. There is a window looking into the bedroom and the walls are pebble accented with Italian porcelain plank floors. South Seas Premium Room with Outdoor Tranquillity Soaking Tub – A nicely appointed bedroom featuring a king size bed, smart TV and convenience outlets for 110 and 240 volts. The bathroom includes a walk in shower, vanity and separate water closet enclosed in frosted glass. All rooms have a patio or balcony, a free standing Tranquillity Soaking Tub for two and also features outdoor dining and chaise lounge. The culinary experience at Sandals LaSource Grenada is unrivalled in the Caribbean, celebrating epicurean treasures from the streets of Rome to the delectable bounty of the sea to Sandals first true steakhouse. Whether you crave an evening of sophisticated gastronomy, the barefoot elegance of oceanside dining, a playful patisserie, or a lively Teppanyaki table, ten unique venues offer a cuisine and ambience to suit every mood. Neptune’s – Neptune, the Roman god of water and the sea, is one of the most well known deities of Roman mythology. It is said that his powers are at the core of Neptune’s our Mediterranean seafood restaurant. After dining at Neptune’s, you just might believe the old tale rings true. For years, the chefs of Neptune’s have made it their mission to provide the most authentic reflection of Mediterranean heritage through robust menu offerings and a sundry setting. From the splendour of the rustic, open-air restaurant design, to the beauty of the turquoise sea in the background, guests are offered a true, coastal Mediterranean experience surrounded by the beautiful Caribbean. Kimonos – Follow the tantalising aroma of exotic spices and perfectly grilled delights to the majestic extravagance of Kimonos, a vibrant, restaurant that serves up the exotic cuisines of the Far East with an interactive twist. 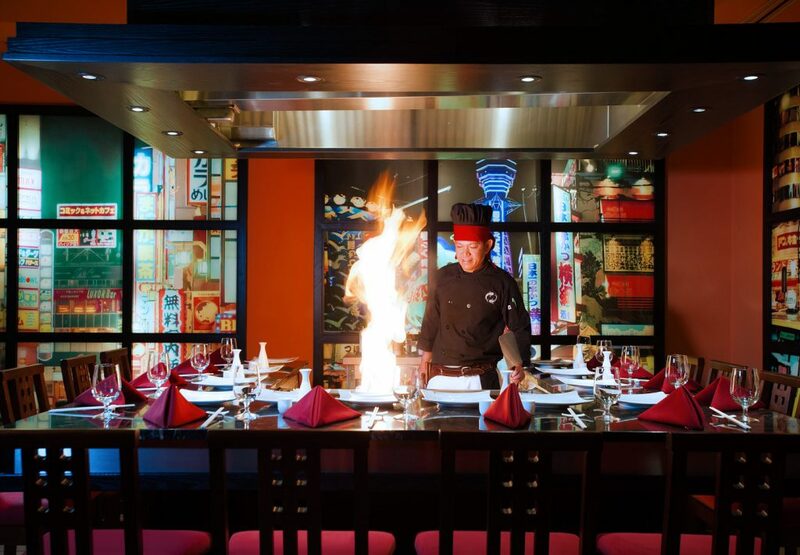 The mid-1940 Teppanyaki cooking style used here is one indication to guests that they’re in for a truly memorable experience. With dim lighting, red accents, and Asian-inspired mahogany-framed windows modelled after the fascinating Shoji sliding screens of East Asia, the decor of Kimonos is exotic, mysterious, and comforting, all at the same time. Despite the lively atmosphere, there’s also a Zen quality that thrives in the midst of it all – the uncluttered space and undressed walls maintain an open, flowing sensibility. Kimonos boasts mouthwatering cuisine prepared by skilful chefs who entertain while cooking on an iron, flat surface grill, as guests eagerly await their exotic fare. Soy Sushi – Discover the Orange Blossom. There’s nothing quite like the dining experience at Soy Sushi Bar, a quaint restaurant adorned with unique Oriental decor, dim lighting, and fresh, delectable sushi. Giving guests a taste of the Far East with traditional and contemporary sushi creations, Soy is named after soy sauce, a customary ingredient in the art of sushi. This remarkable sushi house offers exciting flavors and exotic sushi creations made-to-order. Chefs skilfully prepare sushi using only the freshest ingredients. 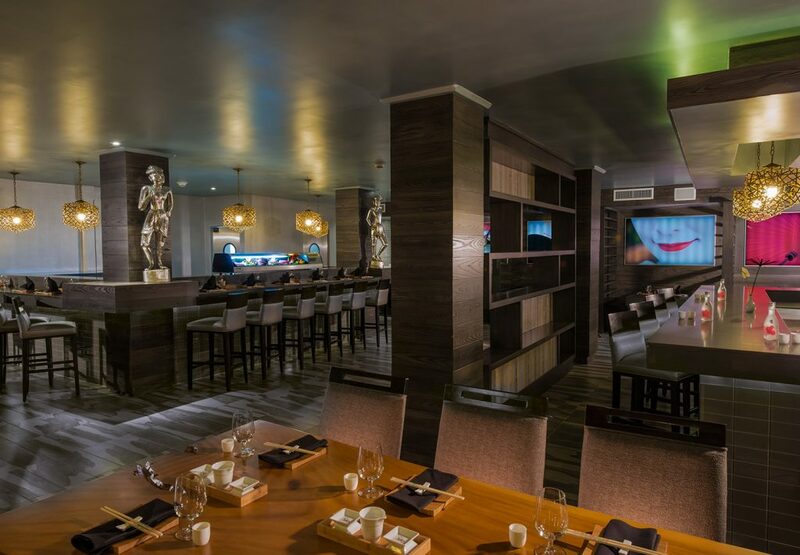 Guests can enjoy a nightcap or pre-dinner cocktail at the bar, where you will discover great ambiance with the stone statues, pendant lighting, and mahogany furniture. Spices – Discover the Spice of Life. For a true island restaurant experience, there’s Spices. With its tropical surroundings, festive hospitality, and exceptional wines and spirits, it’s the perfect entry into Caribbean and Mediterranean cuisine. From succulent seafood and Greek style salad to spicy pizza and Jamaican jerk favourites, there’s a wide range of selections to satisfy any palate. With delicious breakfast options and themed buffet-style dining throughout the day and night, Spices brings flavors from all around the world to one place. Cucina Romana – Discover Italy. Discover Italy. Cucina Romana has a legacy that stretches back four generations. When Sous Chef Thomas Damonte moved to the Caribbean from Grado, Italy in 2011, he brought his generations-old culinary craft with him, carrying on along standing family tradition of cooking up authentic, Italian cuisine . Only the best ingredients are used in the special meals prepared at Cucina Romana, where Chef Damonte skilfully creates inspiring Italian favourites. Chef Damonte uses fresh basil grown in a nearby, onsite garden and local tomatoes to season signature dishes. Second piati and delicious dolci round off the amazing menu choices. Butch’s Chop House – Discover a Cut Above the Rest. 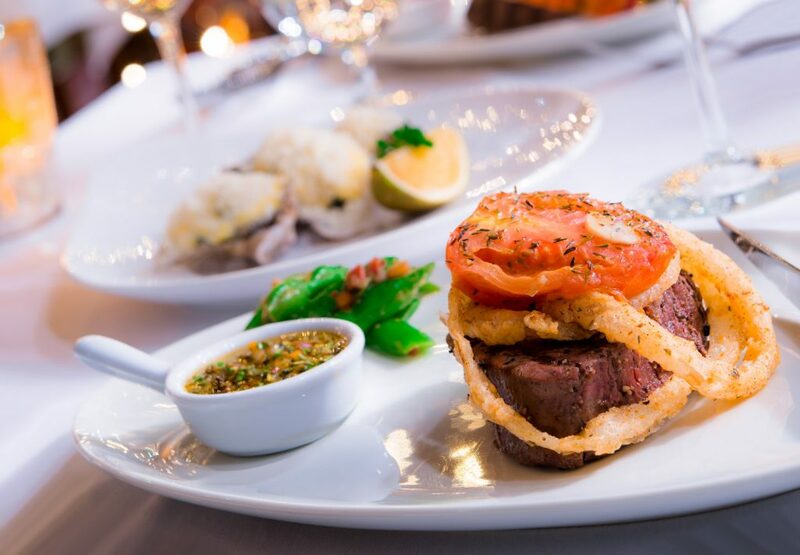 Making its debut against the stunningly beautiful Grenadian backdrop, Butch’s Chophouse is the quintessential place to enjoy prime cuts of meat in the Caribbean. Designed with the ultimate comfort and relaxation in mind for guests, Butch’s Chophouse is adorned with plush furnishings, exposed roof trusses, wood finishes, and intimate pendant and tea lighting, reminiscent of a cozy lodge. Dino’s Pizzeria – Discover a Little Slice of Heaven at Dino’s Pizzeria. After all, nothing says comfort food better than a warm slice of brick oven pizza made fresh with mozzarella, homemade tomato sauce, and tasty toppings. Dino’s Pizzeria hits the spot anytime of day or night with oven-baked bread and choice toppings including Gorgonzola, pear, Brie, prosciutto, sausage, artichokes, seafood and more. On the surface, Dino’s may look like a traditional pizza place but when you take a closer look, you’ll find an incredible variety of pizza with some of the most unique combination of flavors sure to whet the palate of true pizza lovers. Cafe De Paris – Discover a Little Bit of Paris in the Caribbean. Cafe de Paris is giving it a reputation for fine, Parisian treats. When the cafe concept was first introduced in Paris in the 17th century, people fell in love with the neighbourhood feel of the cafe, which over the years became a place to relax. The same ambience is found at Cafe de Paris, the pulse of Grenada’s mornings, mid-afternoons, and evenings. Flowers, bright colours, and stylish patio seating adorns the outside of the cafe. But the rustic-chic, French-inspired decor and romantic atmosphere aren’t the only things to savour at this superb cafe. Tipsy Turtle Pub – Discover the Heart of England. For more than 300 years, pubs have provided a carefree, warm ambiance that afforded comfort to people who wanted to relax with good ale and a good joke after a hard day’s work. Pubs are most certainly fundamental to British culture. Samuel Pepys, famous for his detailed 17th century writings, even described pubs as the ‘heart of England’ With the same vibrant spirit of original British pubs, Tipsy Turtle Pub serves the same purpose as the time-honoured public houses of yesteryear where people gathered together to enjoy life and a cold one. 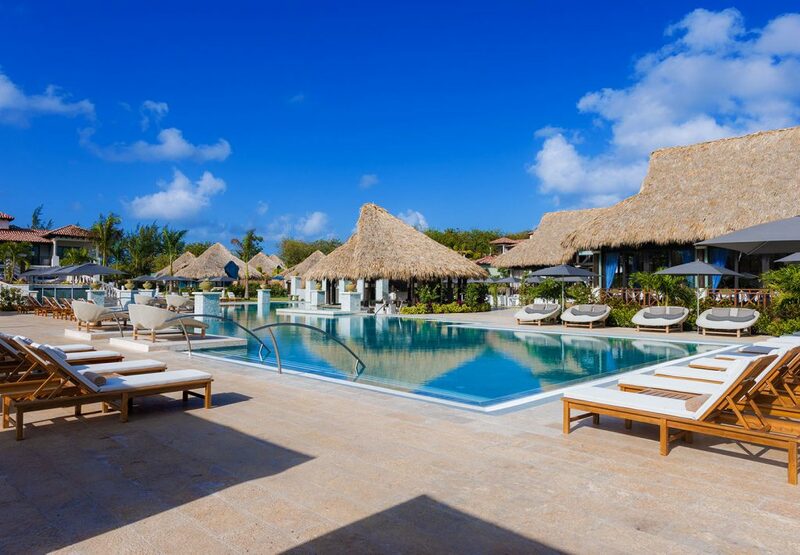 Swimming Pools – Boasting 5 unique pools, which have been completely re-imagined to take full advantage of the island’s sultry, tropical landscape, and nowhere is that more apparent than at the resorts ocean-side pool. 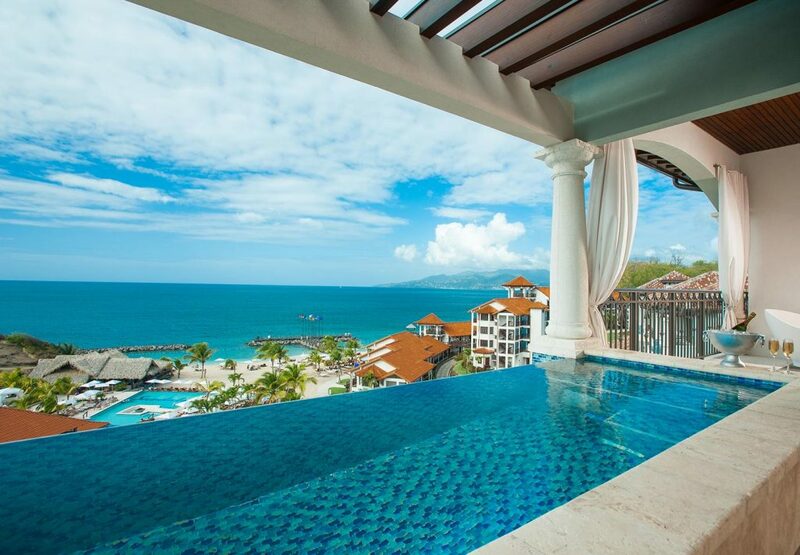 By day, the view is simply astonishing, with the infinity-edged pool blending seamlessly into the horizon. 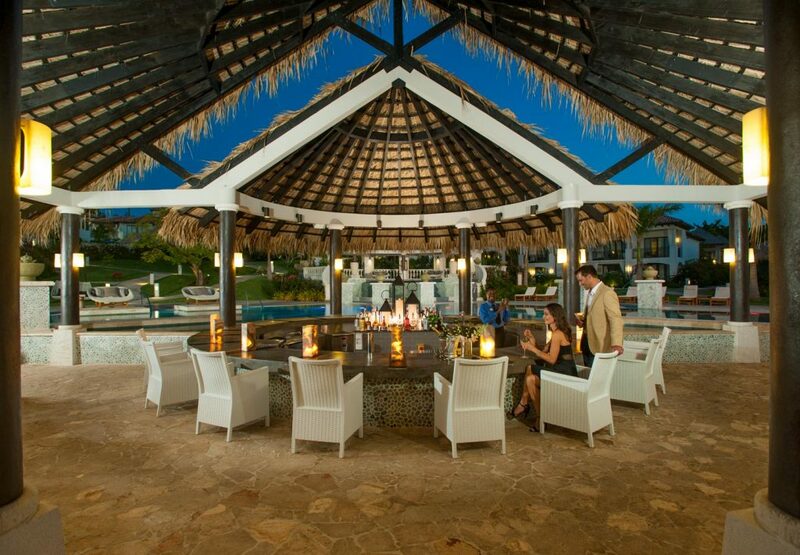 Come nightfall, chic fire pits and fire features transform the pool into a sizzling outdoor lounge. 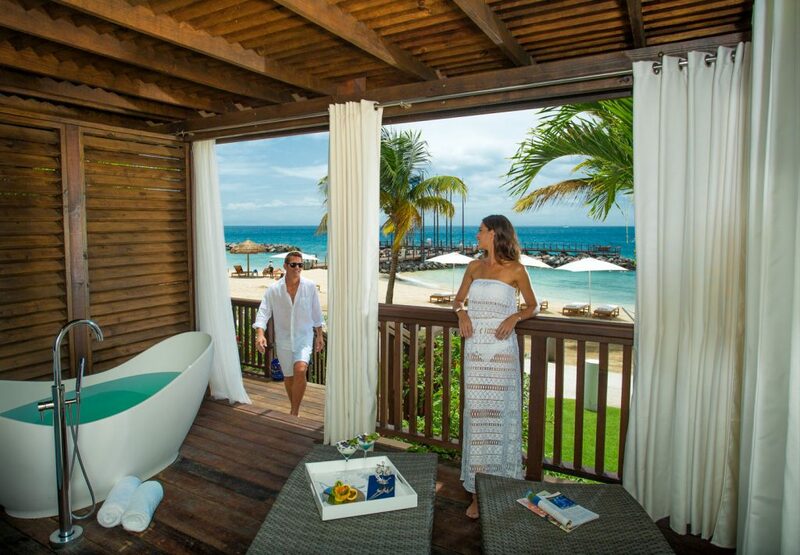 Red Lane Spa – Classic European rituals are reinterpreted with a distinctive Caribbean flair at the exclusive Red Lane® Spa at Sandals LaSource Grenada. You will find a unique sense of tranquillity with a selection of exclusive services infused with botanical products, transforming your quest for inner beauty into a journey of endless self-discovery. 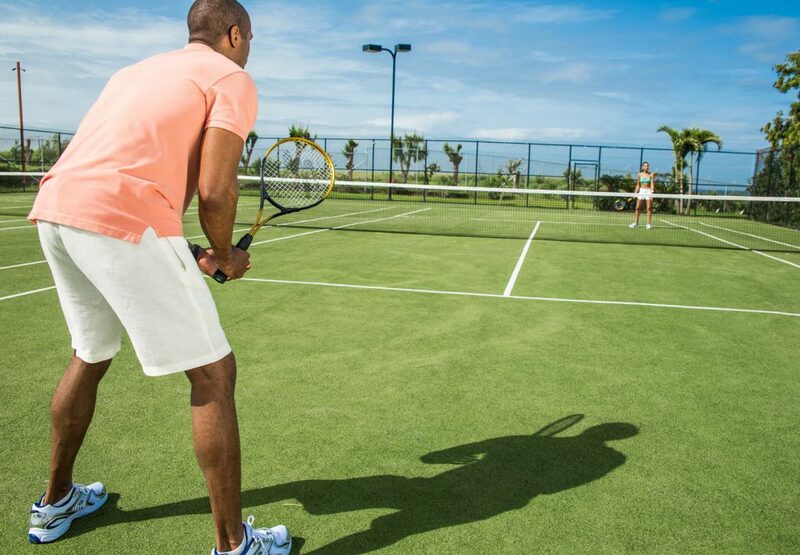 Land and Water Sports – Tennis, day and night, on lighted courts surrounded by fragrant tropical flowers and cool breezes that flow through towering trees. Croquet on emerald-coloured manicured lawns. Volleyball on pillow-soft sand. Plus, our multi-million dollar fitness centres are equipped with state-of-the-art Life Fitness® equipment and certified instructors. Sail away and indulge in a vast array of all-inclusive water sports. With our top-of-the-line equipment, professional staff and unparalleled tropical locations, you can choose to fly across the water – propelled by wind, motor or muscle-power – or dive beneath its pristine surface. Scuba diving at Sandals truly offers you the very best in equipment, staff and unbelievable dive sites – all included! From regulators, BCD’s, masks, snorkels, fins and tanks to state-of-the-art, twin diesel Newton boats and expert guidance from our PADI® certified dive professionals. 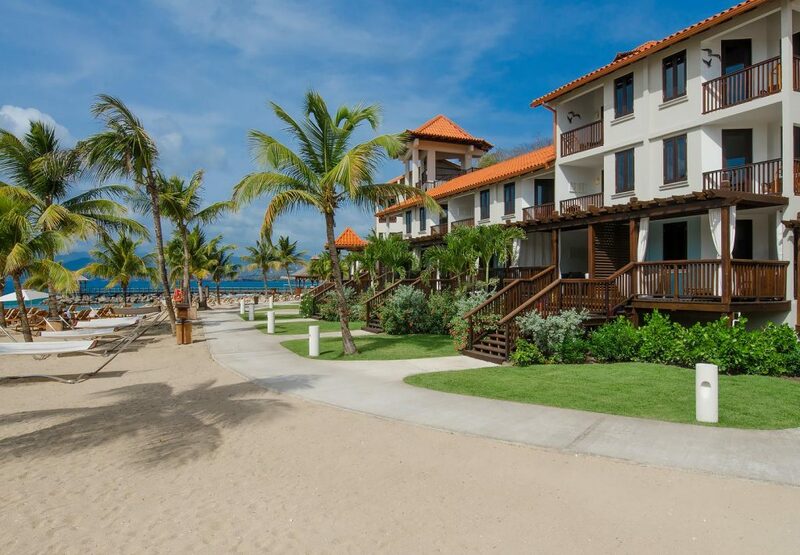 We regularly receive Special Offers and Holiday Deals for Sandals LaSource Grenada, including the 2 for 1 Sale and flight upgrades. Please call us on 01928 246 243 for the lasts news and offers.